Would you wait in line more than 45 minutes for a sandwich? I guess I would, and am, as I start writing this post. I have food routines at home. There are a few places I visit where I have food rituals. Seattle, Los Angeles, Las Vegas and Osaka to name a few. With a full day in Seattle, I’m getting in most of them. 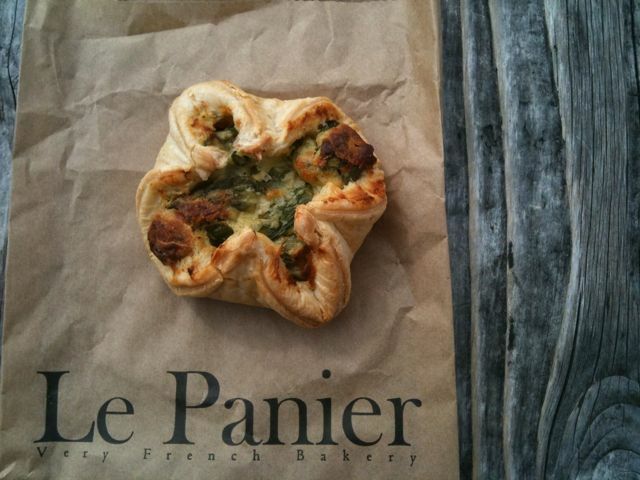 My morning started with a walk to Pike Place market to Le Panier bakery. Here I always pick up a few savory pastries. Today I got asparagus and a mushroom. The pastry is so light and fluffy and the filling is simply delicious. Usually we take our treats to go, and sit out behind Pike Place Market overlooking the water. 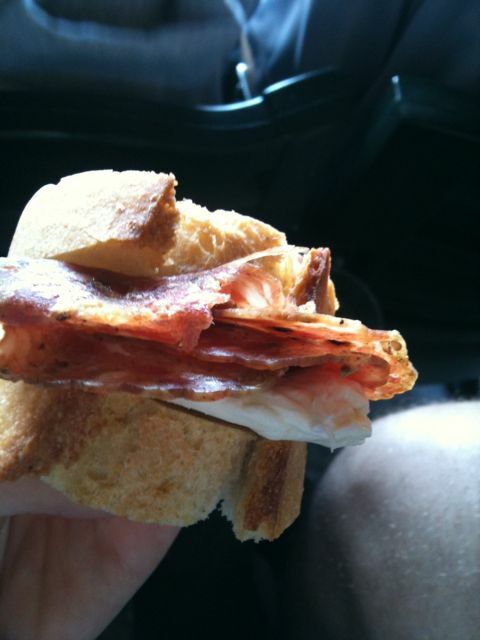 Because it was a day game, and because you can bring outside food into Safeco field, I decided that the perfect lunch would be a Salumi sanwich! 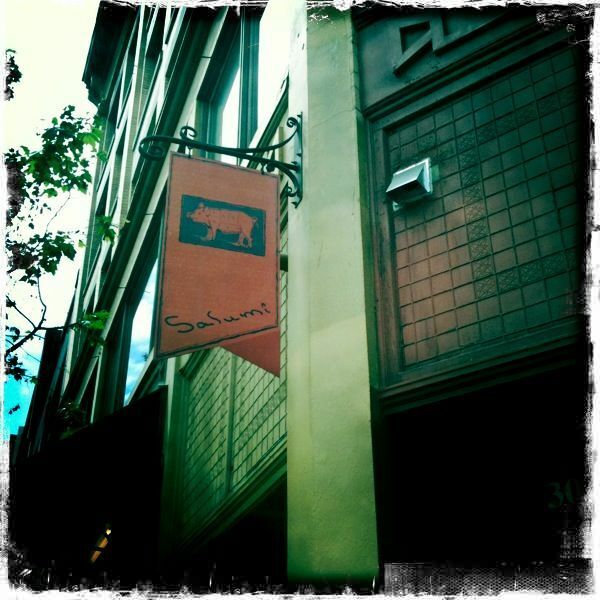 Salumi is the place to visit for an amazing meal of cured or warm slow cooked meats. If you don’t know the story behind this place, in a nutshell here goes… Salumi was started by Mario Batali’s father Armandino after he retired from Boeing. These days you don’t see Armandino behind the counter, but his daughter, (Mario’s sister) is always there. You can tell that there is so much love put into every product they serve at Salumi, and even though there’s always a line up out the door, every customer is treated like family. If you go and decide to eat in, don’t worry if it looks like there are no seats available. There may not be as you’re waiting in line, but they magically appear as soon as you’re looking for one. Another tip, order off the specials board. The soups and pastas, especially their gnocchi, are delicious too. This is where I started this post, but in fact I did not wait in line for 45 minutes for a sandwich, but opted for a lovely assortment of meats, cheeses and olives instead. What changed my decision is the fact that the staff come out with plates of salumi to share with people waiting in line. Having a few different types of these tasty meats, I knew I wouldn’t be able to choose just one for a sandwich. 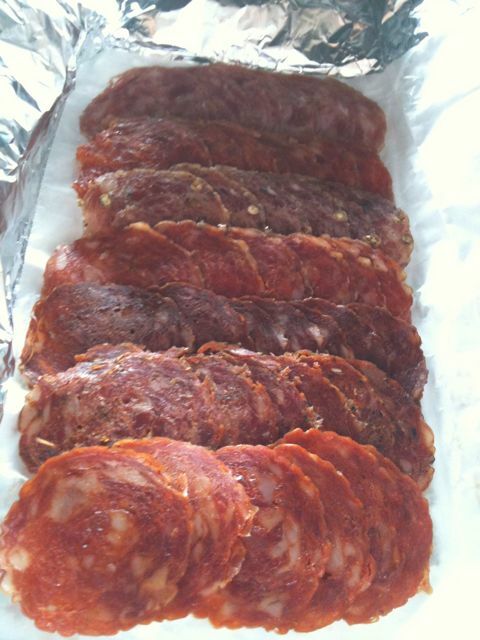 What I did get, (in no particular order) was the Sopressata, Hot paprika, Mole, Finochiona, and Salumi salami. All were totally unique and there was so much flavour in these thinly sliced coins of cured pork products. I was given a hunk of baguette to eat with my lunch, so I made little mini-sandwiches for myself. 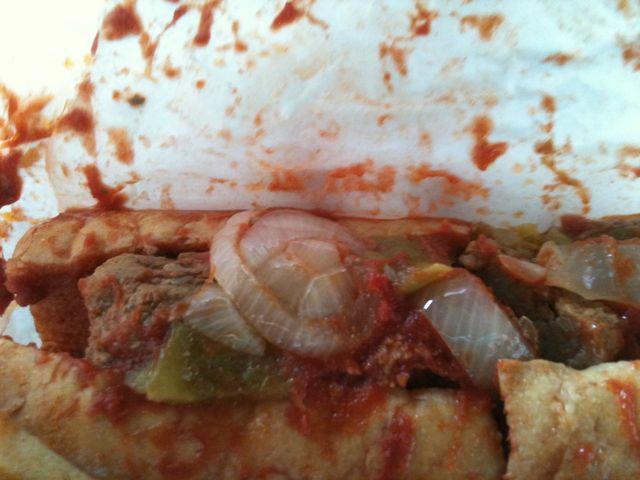 I was happy when Ben ordered the meatball sub because I knew he’d share with me. A morning of eating at Pike Place Market, followed by an afternoon at eating at the ballpark with some shoe shopping at Nordstrom in between can be filed under the category of “Susy’s Favorite pre-planned vacation days”. an italian guitarists who sahres your zeal for fine foods told me that finocchiona got its name from a stolen salami that had been hidden in a sack of fennel or something to that effect. truth or myth? Hopefully the truth! Sounds much more romantic than meat pressed together with spices. Next PostNext SEA/PDX: Day 2 – When 1 door closes… Hello Harvest Vine!